For years, health professionals and nutritionists have touted the health benefits of the sea, from omega-3's that support a healthy heart to the numerous benefits of sea vegetation. Now there is new hope for those suffering with arthritic pain and it's all thanks to the New Zealand Green-Lipped Mussel. The Green-Lipped Mussel has unique anti-inflammatory properties not shared by other similar mollusk species. 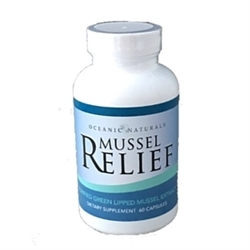 Oceanic Naturals Mussel Relief is a freeze-dried extract of New Zealand green-lipped mussel (Perna canaliculus) that provides relief from the symptoms of arthritis for people who suffer from this painful and debilitating disease. For those looking for an all natural, safe and effective option and relief from arthritic pain Oceanic Naturals Mussel Relief is the solution. Provides the building blocks for the repair of damaged cartilage. Speeds the recovery of soft tissue damage associated with sporting injury. Mussel Relief is a nutritional supplement and is not intended to treat or cure any medical condition. Consult your doctor or pharmacist before taking any dietary supplement. Oceanic Naturals Mussel Relief is a freeze-dried extract of New Zealand green-lipped mussel (Perna canaliculus) that provides relief from the symptoms of arthritis for patients who suffer from this painful and debilitating disease. Not only reduces symptoms such as pain, but also improves joint function and mobility. May help protect the stomach from the potentially harmful effects of the anti-inflammatory drugs used to treat arthritis.